I did sign up to write to, but, chickened out the day before when I had a look at the 30 day writing schedule, I find it hard to write more than a sentence or two a day!!! 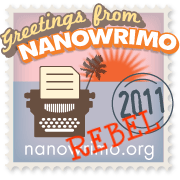 So, although I am writing new material, I am using an older theme, and by Nano’s rules, I’m a rebel. Not that it matters too much. Getting further with the novel seems more important to me than another half finished story. 50K words is nowhere near an acceptable count for a novel. You should have tried it. Certainly an exercise in stress management. I’ll remember to give you a push next year. Even if you don’t finish, I bet you’ll get more done than six months of regular procrastination.